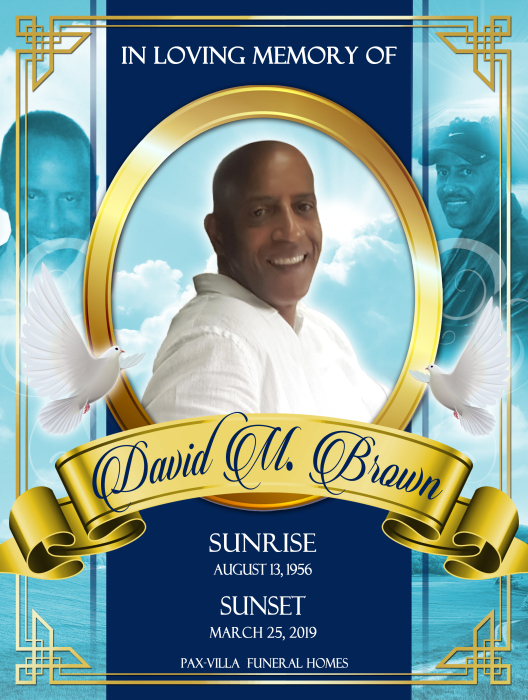 David Marion Brown was born on August 13, 1956 to the late James Marion Brown and Estelle Louise Ramsey. David was raised with 3 sisters and 4 brothers. He graduated from Gainesville High School in 1974 and shortly thereafter enlisted in the United States Air Force. He was an avid basketball player in high school and continued playing his favorite sport while in the military. He served in the Air Force for 6 years and continued working in the federal government after he was honorably discharged. While working full time, David furthered his educational pursuits obtaining an Associates, Bachelor’s and Master’s degree. He had a distinguished career in the United-States Postal Service; retiring as the first African American Postmaster at the Ocoee, Florida facility. David served as an Honorary Sheriff’s Deputy for the Orange County Sheriff’s Office for over 30 years. David and his wife received the highest accolades provided to volunteers, the Sheriff’s Citation Medal, for their outstanding support and contributions to the office and citizens of Orange County. He was proud of his vocation and educational accomplishments; his greatest achievement came from being a father to his four beautiful daughters. David was a loving and devoted father who provided support and guidance to his girls. He LOVED them unconditionally and there was nothing he wouldn’t do to make them happy! He was also a loving and devoted grandfather to his 2 grandchildren. David is predeceased in death by his daughter Astrian Beale, his siblings Louise and Bobby. In 2003, David met his soulmate and the love of his life, his wife Cynthia. They had an instantaneous connection and the synergy between them was inseparable. As husband and wife they shared a beautiful, devoted and loving relationship; full of joy and laughter. David had a huge heart and helped everyone who came in his presence. He left a lasting impression for all who had the honor to know and love him. David will be TRULY MISSED by those he touched! His Loving Grandchildren: Quiana Brown (Astrian) and Jaron David Barnes (Nikkia). His Beloved Mother-in-law: Jade Baker and “Mom” Novella Strawder and many family Members and Friends.